Countless detectives, real and fictional, have been inspired by Sherlock Holmes, and that includes the ladies. Author Amy Thomas, who blogs at Girl Meets Sherlock and podcasts with the Baker Street Babes, is here today to tell us about some of her favorite female Sherlocks. Take it away, Amy! For most of literary and screen history, Sherlock Holmes has been male. Sir Arthur Conan Doyle wrote about a vocational detective in a day when many career paths weren’t yet open to women; however, Doyle surrounded Holmes with clever ladies—notably Irene Adler, who outsmarted him in A Scandal in Bohemia and Mary Morstan, the first wife of Dr. Watson, whom Holmes complimented on her potential for detective work in The Sign of Four. The casting of Lucy Liu as Joan Watson in Elementary broke a glass ceiling of sorts, but we have yet to meet a female Holmes who makes it into the public consciousness in a major way. (This may change if acting legend Emma Thompson gets her wish of being the first mainstream female Holmes.) Until then, however, we have a buffet of fantastic female detectives inspired by the pipe-smoking resident of Baker Street. 1) Cora Strayer: The only non-fictional woman on this list is Cora Strayer, who opened her own detective agency around 1899. Ms. Strayer was involved in murder investigations and other types of cases, a notable police chase, and eventually became the leader of a female cavalry regiment. It seems no one has yet written a definitive historical or novelized book about her, but you can read much more about her incredible exploits at the Strange Company blog. What Strayer shares with Holmes is her brazen confidence in her skills as an amateur detective. Not once does she appear to have been daunted by the fact that women were barred from being official detectives during the Victorian period, much like Holmes, who had a limitless belief that he could do a better job at solving cases than the police could. 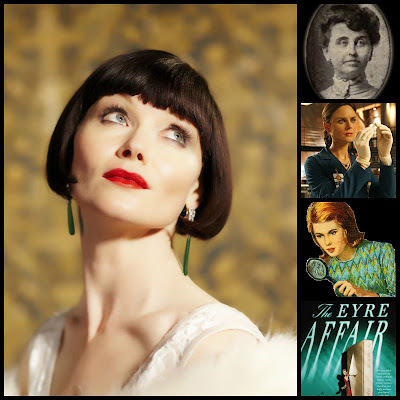 2) Phryne Fisher: Phryne is the protagonist of a series of novels by Australian author Kerry Greenwood. Miss Fisher’s exploits take place in Melbourne in the late 1920s, where she uses her wealth and wit to solve all kinds of crimes. The two main things she shares with Holmes are keen observational powers—like him, she uses small clues like dirt on someone’s shoes or the type of ink used in a letter to solve mysteries—and his bohemian lifestyle. She’s a liberated woman who refuses to play by any kind of societal rules. Like Holmes, this means she’s sometimes relegated to the fringes of society, but also like Holmes, she doesn’t much mind, because that’s where the clues are found. You can read more about her in her novels and also watch her in action in the brilliantly realized Australian TV series Miss Fisher’s Murder Mysteries. 3) Nancy Drew: Moving forward in time, we find a classic from many of our childhoods, the indomitable Nancy Drew, who was created by a publisher named Edward Stratemeyer and written by many authors under the shared pseudonym of Carolyn Keene. Nancy is the embodiment of the woman who does everything she pleases without a hair out of place or relinquishing her determined femininity. One of the main traits she shares with Holmes is his reliance on friendship. It’s almost impossible to think of Sherlock Holmes without thinking of Dr. Watson, and when we remember Nancy, it’s equally hard to forget her friends Bess. George, and Ned, who accompany her on her adventures. As children, we wanted to be part of their posse, just as adults, many of us idolize the bond between Holmes and Watson. It’s worth giving Nancy another look for the sake of nostalgia, or, if you’re so inclined, to take part in the ongoing, nuanced discussion about what she means as a feminist cultural icon. Her books, both the original and subsequent series, remain available, Emma Roberts portrayed her on film in 2007, and modern classic TV detective Veronica Mars can be viewed as an update of her character. 4) Temperance Brennan: Forensic anthropologist Temperance Brennan, protagonist of currently-set mystery novels by Kathy Reichs, has a career that is less directly like Holmes’s vocation than most of the women on this list, but she, perhaps, owes the most to him when it comes to temperament. She shares his brilliance, his meticulous methods, and his conviction of his own rightness. Though she begins at a different starting point—a victim’s bones—she uses Holmesian methods of painstaking research (albeit with the inclusion of modern technology) to solve gruesome crimes. The culture understanding of Brennan comes largely from the television show Bones, on which Emily Deschanel portrays a woman who illustrates the strengths of a mind as objective as Holmes’s, but also its weaknesses where emotion and relationships are concerned. Read about Reichs’s original conception of the character in her novels and watch Deschanel’s version on Fox’s Bones. 5) Thursday Next: The least traditional detective on this list is undoubtedly the protagonist of Jasper Fforde’s novels about a futuristic, dystopian England in which an entire police force exists within the world of fiction. Thursday’s love of the written word and her English cultural heritage reflects Holmes’s own extensive knowledge and love of Englishness, and her absolute calm in the face of utter absurdity (like her journey into Jane Eyre) is evocative of his objectivity in the face of seemingly supernatural ideas like that of a spectral hound. Thursday is every bit her own woman, as independent and stubborn as Holmes on his most cantankerous day, and every bit as engaging. Read more about her in her novels. This list could go on and on, because nearly every detective in existence owes something to Sherlock Holmes, from Miss Marple to Maisie Dobbs. This is good news for all of us, because until we have a female portrayal of Holmes to call our own, we will never lack for exciting, courageous, and brilliant female detectives to read about and enjoy. Great list. I may have to check out the Phryne Fisher books. I need to check out these detectives! I have only ever read the first Thursday Next book, but I need to read so many more!